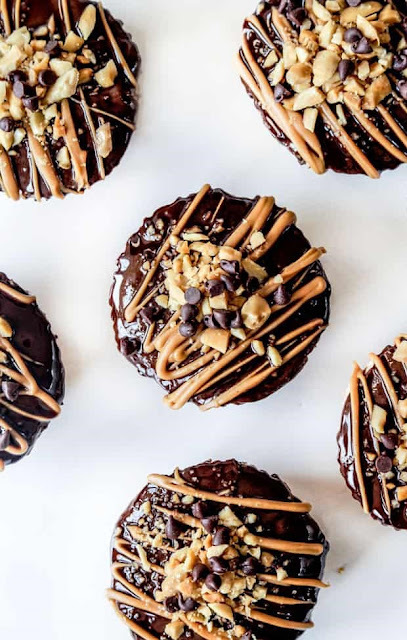 These Chocolate Peanut Butter Pies are an easy, make ahead, almost no bake rich, decadently delicious dessert with a toffee graham cracker crust, creamy peanut butter filling, and silky chocolate ganache topping sure to satisfy all your peanut butter, chocolate cravings. They are make ahead and freeze so they are the ideal stress free entertaining or special occasion dessert! They are mini Chocolate Peanut Butter Pies which means you get the perfect ratio of crust to filling. Mini means they are easy to transport, serve and eat – not to mention they are so cute! They boast a buttery graham cracker crust that’s not just graham crackers and butter but toffee bits for a Toffee Graham Cracker Crust. Perfection. 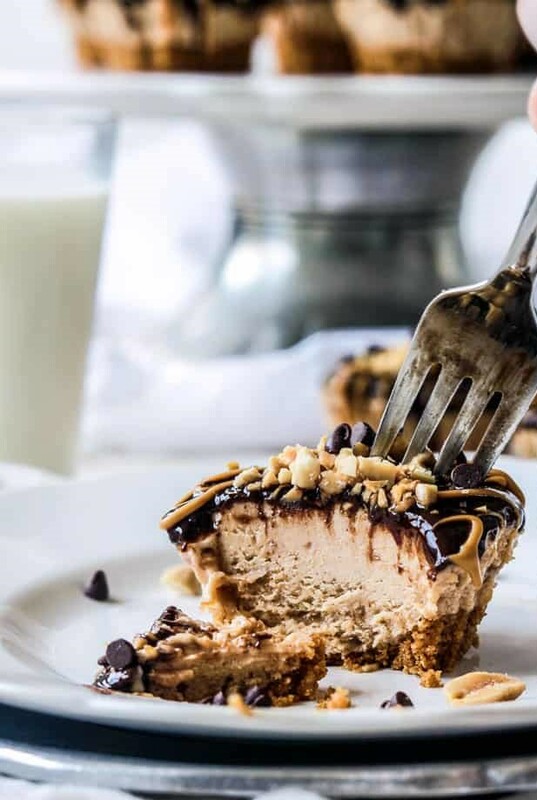 This Chocolate Peanut Butter Pie recipe is almost no bake. You bake the mini crusts for about five minutes and that’s it for the oven! Baking helps the crust bind together so it doesn’t crumble all over when you bite into the mini pies because you don’t want to miss a crumb of this crust. The Toffee Graham Cracker crusts are delish but not overpowering – the perfect compliment to the peanut butter filling. Preheat oven to 350F. Line a 12 count regular size muffin tin with muffin/cupcake liners. To a separate mixing bowl (or remove heavy cream), using the same beaters, beat peanut butter and cream cheese until smooth. Add the confectioners' sugar, toffee bits, vanilla, and salt and beat until smooth (it will be thick). Gently fold the whipped heavy cream into the peanut butter-cream cheese mixture with a spatula until completely blended. Meanwhile, prepare Chocolate Ganache by microwaving heavy cream for approximately 90 seconds until hot but not boiling. Add chocolate and let sit one minute then whisk vigorously until smooth. Let cool to barely warm, stirring occasionally (it will thicken as it cools.). Spoon the Chocolate Ganache over the peanut butter cups and spread with the back of the spoon (its okay if some spreads over the edges). When to Garnish: You can garnish your Chocolate Peanut Butter Pies either after you have spooned your ganache over the pies and the chocolate has set (it should set in about 5 minutes at room temperature) or freeze the pies after the ganache, then garnish and freeze again. I don't recommend garnishing right before serving because you will want the pies to firm up again after sitting at room temperature while you garnish. It is also optional if you garnish with or without the wrappers. I like to keep the wrappers on for the ganache so it doesn't spill over the sides and then remove the wrappers, place pies on a baking sheet and proceed to garnish, then freeze. There really isn't a right or wrong though, just as long as you freeze the pies after you garnish.